Camelroc Guest Farm - Fouriesburg Accommodation. Facing the spectacular sandstone hill with the outcrop shaped as a camel Caledon rivers and is close to Caledonspoort border post. Camelroc can definitely be recommended as a good base from which to explore the Eastern Free State as well as Lesotho. 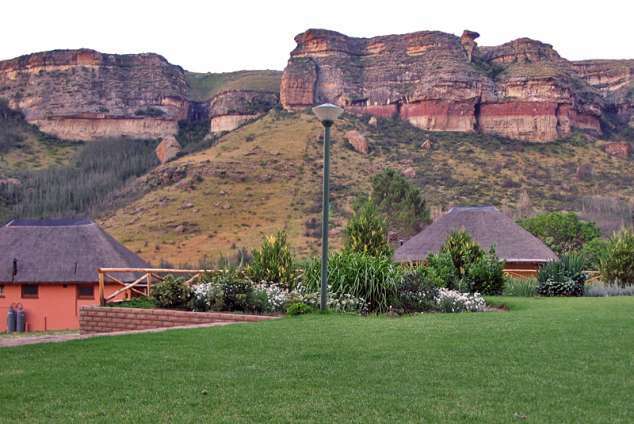 For those who prefer to stay at base and relax, one can opt to take walks into the mountain, have a swim in the pool and braai beside the cottage whilst enjoying the serenity and splendour of this Eastern Free State countryside. There are diverse activities to be enjoyed and places to be discovered in the area. Camelroc has seven luxuriously appointed chalets sleeping from 3 to 8 persons. (the hikers cabin has been converted to a 2 bedroom chalet). In the main homestead one can be accommodated in their guest house, three rooms sleeping 6 are all en-suite and tastefully decorated with Oregon pine furnishings. Guests are welcome to enjoy the use of the thatched entertainment area around the pool or play table tennis on the patio. There is a netball ring in the garden and ample space to play ball games & volleyball. The Guesthouse, built from traditional sandstone, has a fireplace in the lounge. All the other rooms have heaters for the colder winter nights. The perfect halfway stop between the Cape and KwaZulu-Natal. Come and enjoy this country stay with its beautiful views of the countryside, bird life, small game, rock art and the poplars turning in autumn. 45876 page views since 20 Feb, 2002.